I have given a detailed introduction of oats in my old recipes. My blog has a host of oats recipes namely oats idli, upma, oats poha upma, Oats-moongdal tikki, Oats ragi rotti, Oats-dry fruits laddoo, Oats appam, Oats-poha chivda and Oats veg roti. Today i would like to add one more recipe and here it goes…. 1. 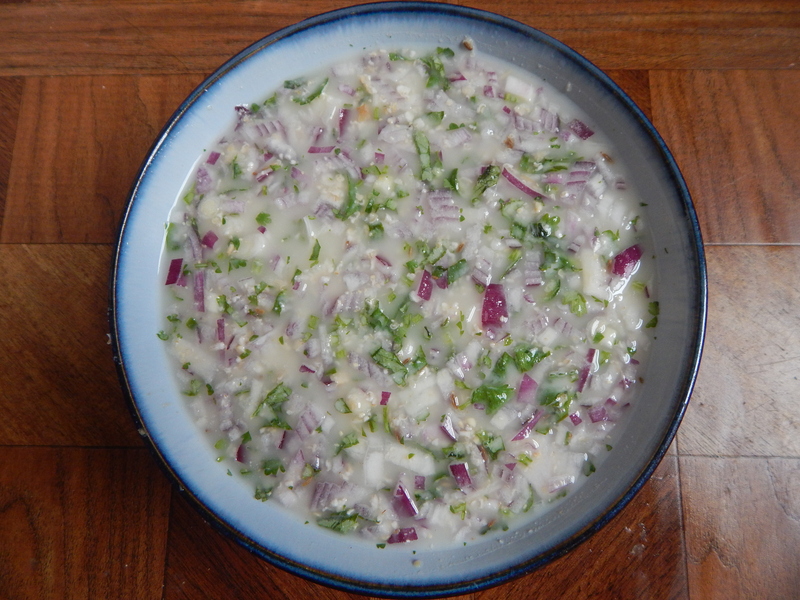 Peal and chop onions, chop green chili, grate ginger, wash and chop cilantro and keep it aside. 2. Pulse half the quantity of oats in the mixie to a coarse powder and the remaining half can be added as it is. Transfer the rice atta, wheat atta, coarse oats powder, oats into a wide bowl. Add in the chopped ginger, green chili, cilantro and onions as well to it. Also add cumin and salt to it. Let the batter set aside for about 10 minutes. 1. One can even add the quaker oats as it is since it is not the whole oats. 2. The quantity of water can vary depending upon the fineness of rice atta and wheat atta. 3. I have used whole oats hence i have used half the quantity of powdered oats. 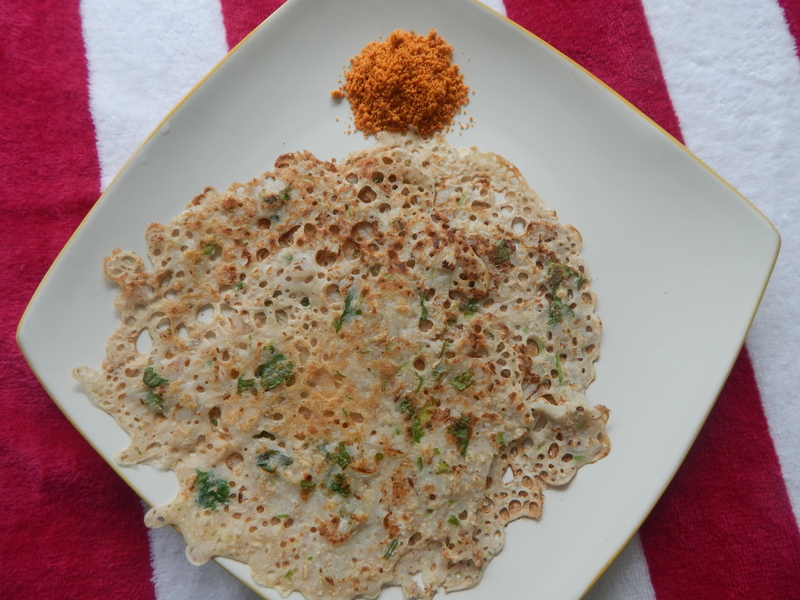 This entry was posted in Uncategorized and tagged Dosa hut, oATS RECIPES/DISHES. Oats theses days one of our favorites here at home. I have already put up a few oats based dishes like the Oat idli, Oats Upma, Oat-Poha upma and here now adding one more to this series is the Oats-Poha Chivda. Some of you might recognize this dish and find it similar to the traditional poha-upkari that I put up here a couple years ago. It is a healthy, tasty and easy to prepare, so what more can you ask for ! Ideal for an evening tiffin. 1. Place a skillet on low flame with oats in it and warm it up till it turns crispy and a nutty aroma oozes out. 2. Place a skillet with 2 Tablespoons of cooking oil in it on low flame. When heated fry cashews in it till it turns light brown and crispy. Transfer it to another bowl and keep it aside. 3. In the same skillet fry Peanuts as well till crispy. Transfer it to the same bowl to which the fried cashews are placed. 4. Place a skillet with only 2 Teaspoons of cooking oil in on medium flame. On being heated add mustard seeds to it. When it splutters add split green chilly, red chjilly pieces, and curry leaves. When done, add Raisins to it and stir well till it swells and fries. 5. When fried add Dalia dal and also all the powders in a row. 6. Finally, add fried Cashews, Peanuts from step-2 and 3 to it and also warmed up Oats from step-1 to it and also Beaten rice and salt , powdered sugar, Garam masala powder, A pinch of Amtur powder and toss well and and leave it on low flame for about 2-3 minutes stiring with a wooden spatula so that oats is not powdered. 7. Transfer it to bowl and you are all set. You can garnish with shredded coconut if you wish. Yummmmmmmmmmmm ! Also one can even relish it with chopped onions and cilantro too!!!!!!! 1. Thin Beaten Rice/Poha should be used for the dish. We normally dry the poha in the strong sun for about an hour to get rid of the raw smell. 2. Oats should be warmed up on low/medium flame depending upon the size of the burner stirring at intervals so that it does not get burnt. 3. 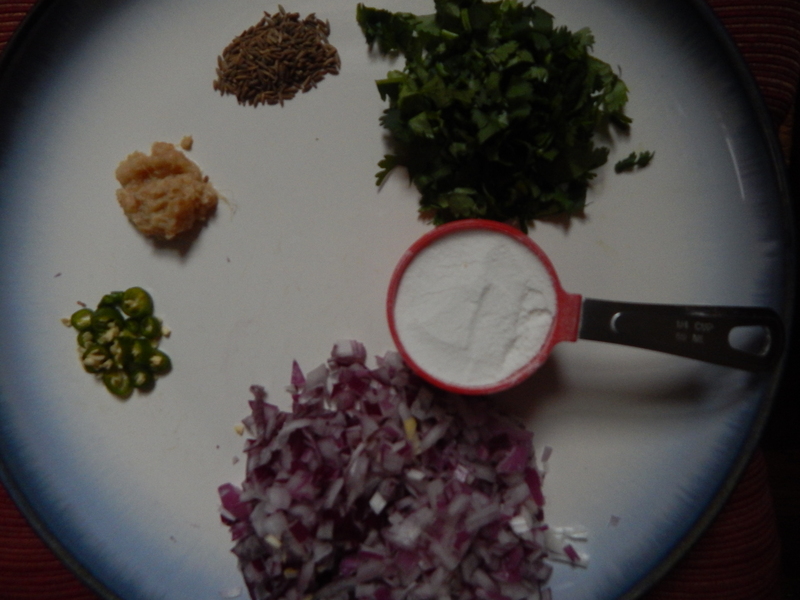 One can use Garlic in place of Asafoetida powder. 4. Dry fruits, if you like, are always an optional addition. This entry was posted in Uncategorized and tagged Fried snacks, oATS RECIPES/DISHES, Tiffin. Oats has become very popular due to the increasing consciousness regarding health. I have already put up Oats-upma, Veg roti/Paratha, Oats-Peanut laddoos and Idli. Here now is yet another Oats dish, one that tastes great and that can be prepared for a change with veggies of one’s choice. I prepared a couple of times and very well received here at home. So maybe this is a chance to get some wider acceptance among my readers and fellow bloggers ! Let me know if you like this one. 1. 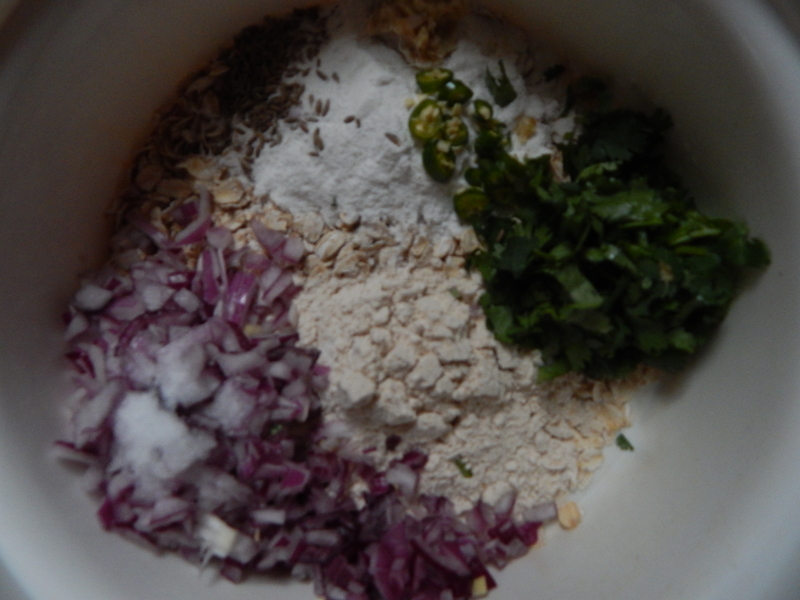 Wash, peal and chop onions fine, chop green chilly too, wash and chop coriander leaves and keep it aside. 2. Wash Beaten rice and add 1 Teaspoon sambar powder to it, mix well and keep it aside. 3. Place a skillet on medium/low flame and dry roast Oats till you get a nutty aroma but make sure you do not burn it and keep it aside. Place the same skillet with 4-5 teaspoons of cooking oil in it on medium flame. When heated add mustard seeds to it. On spluttering, add black gram dal and cumin seeds to it. Add chopped green chilli, curry leaves, red chilli pieces and let them all fry till done. Finally add chopped onions, turmeric powder and required quantity of salt to the dish to it and let it fry till transparent. 4. When done add all the chopped veggie and cook it till done closing it with a lid but mind you without adding water. 5. When done add beaten rice mixture from step-2 to it and stir in well. If needed sprinkle a little water for it to cook. 7. Finally add grated fresh coconut, chopped cilantro from step-1 to it and squeeze lemon juice and mix well and switch off the flame. 8. Transfer it to a serving bowl. 1. Use medium variety of poha which we use for Poha upma. 2. I have used Quaker brand oats. In this case I did not even sprinkle water. 3. Veggies should be grated and chopped fine so that they cook fast with poha. 4. One can add any masala powder of their choice. I have added home made sambar powder. This entry was posted in Uncategorized and tagged oATS RECIPES/DISHES, Tiffin. Oats are becoming very popular these days due to growing health consciousness. The response to oats upma and requests for other oats-based dishes encourage me to put up these tasty and healthy recipes which I believe readers like you will enjoy – not only looking at the pictures on this blog but also preparing the dish. Being crispy in texture, oats dishes turn out crispy and therefore tasty, especially in this rainy season. I have already put up Oats Upma, Oats idli, Peanut-Oats Laddoo, Oats paratha and today, Oats veggie roti. 1. Powder the oats in the dry grinder and transfer it to a broad bowl along with upma sujee/rawa. 2. Wash and chop spring onions and also the greens and keep it aside. Wash and chop green chilly, cilantro, grate ginger and coconut and transfer all the ingredients to the bowl. Add salt, cumin seeds if needed. One can even add Chopped capsicum to it. 3. Add required quantity of water and keep it aside for about 20 minutes so that sujee and oats mix together to the required consistency. Sprinkle a little more water if needed while spreading the dough on the banana leaf. 4. Wash and wipe the banana leaf and place a little dough and flatten it to required thickness by dipping your hand in water. 5. 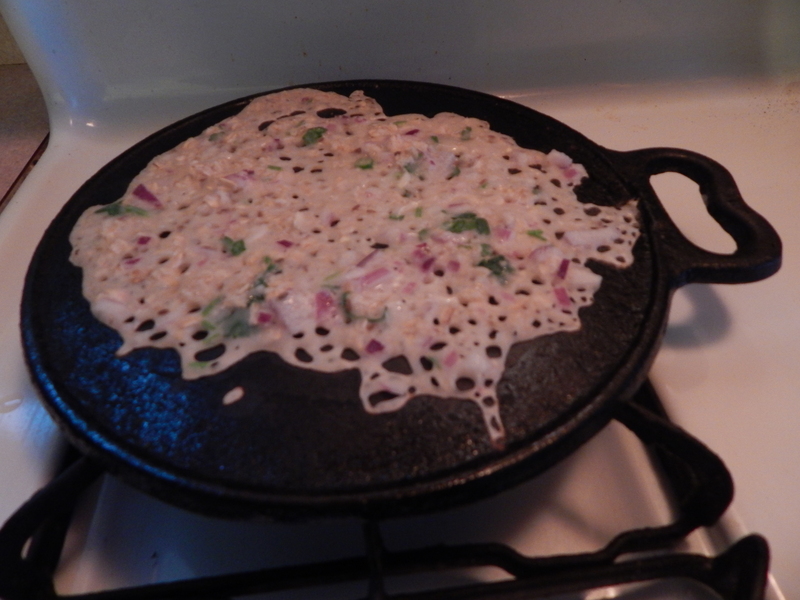 Place a dosa skillet on medium flame with a teaspoon of cooking oil. When hot, place the roti and adjust the flame accordingly with the leaf facing upwards. When roti is done the leaf automatically comes up and can be removed. 6. When done, remove the leaf completely and flip it to roast on the reverse adding a little Saffola oil. 7. Roti is ready to be served and enjoyed hot with tomato sauce/ketchup or any dry chutney powder of your choice. This entry was posted in Uncategorized and tagged 30 minutes, Breakfast, Newbee, oATS RECIPES/DISHES, Parathas and Rotis. Oats is very popular these days as a healthy ingredient given the high fiber content and it’s utility in making different kinds of dishes. I have already put up oats idli and oats upma, the latter especially has been much appreciated by the viewers of this blog. Today, I would like to put up Oats Paratha and hope it is enjoyed by all. It turned out very tasty when made in my kitchen for the first time recently. Here it is. 1. 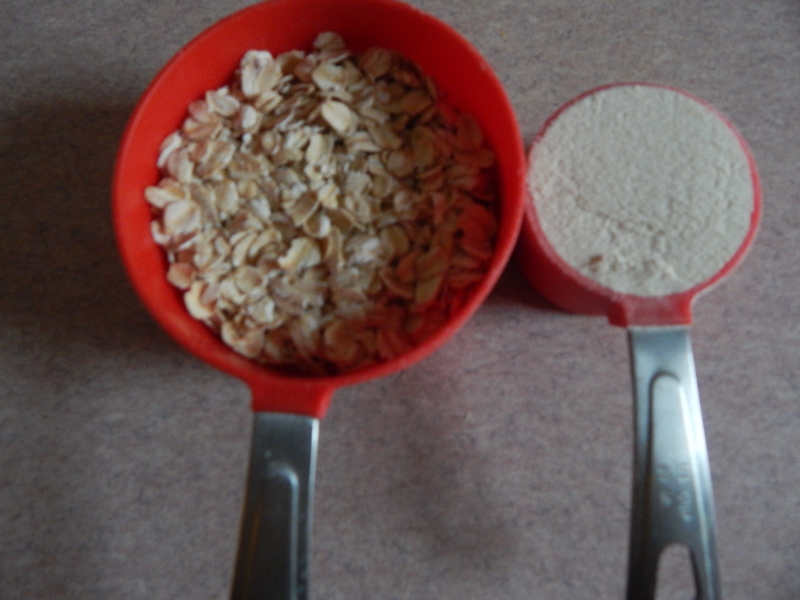 Powder any oats of your choice in the dry grinder to a fine consistency. Sieve it in the atta sieve/sifter and if any remaining, sieve again and mix it with the previously sieved oats powder. Powder cumin seeds, coriander seeds, ajwain too and keep aside. Transfer all ingredients to the atta sieve, including all the powders and salt too. 3. Mix the ingredients with your hands and add water in steps to make a pliable dough – little softer than the usual chapati dough. Keep it aside for a while, closing it with a lid. Pinch out the required quantity of the dough and knead it properly till it is smooth. 4. Dust the pinched out ball in atta and roll it into 4-5″ sized disc and apply oil to it. Fold it into semi circle and also apply oil again. Fold it into triangular shape and keep it aside. Repeat the same process for all the rotis. This process of folding and greasing helps to make layers. 5. Roll out the triangular shaped roti on a thick plastic sheet dusting it in atta. Roll it to required thickness and ensure that you are rolling evenly all over the roti. 7. When done, just flip it and roast it again applying a little oil. Press slightly on all the sides with a spatula. 8. Enjoy hot with either tomato sauce or the dry chutney powder and Amul butter. It tastes great and the layers of the roti will be like that of veg- puff. One can even enjoy with any side dish of one’s choice. Oats paratha with tomato ketchup. 1. Use any brand of Oats. 2. Powdering it to a fine consistency helps to mix with wheat atta well . 3. One can make their own proportion to atta and the oats. This is my version. This entry was posted in Uncategorized and tagged 30 minutes, Breakfast, Newbee, oATS RECIPES/DISHES, Parathas and Rotis, Party dish. 1. Wash and chop all the veggies of your choice like capsicum, french beans, cauliflower, carrots and keep it aside as shown in image-1. 2. Place a wide bowl and cook chopped beans and carrots with a little salt. When they are half-cooked, add chopped cauliflower and cook till done. 3. Place a skillet with fine sujee in it and dry roast till you get a pleasant aroma and keep it aside. In the same skillet, add 3-4 Teaspoons of cooking oil in it on the flame. When hot add mustard seeds to it; as the spluttering starts add blackgram dal. When fried add raisins to it along with chopped green chilly and curry leaves to it. Fry a bit and add chopped onions to it Continue frying till done adding little salt to it so that it is not burnt. 4. Now add chopped capsicum to it and stir in for a while till done and add Green peas as well to it and cook till smooth. On the other gas place 1 and 1/2 cups of water in a bowl on low flame till it starts boiling. 5. Add roasted fine sujee from step-2 to it and stir in and add boiling water to it and close the lid for a while so that it is cooked. 7. Now add cooked veggie from step-2 to it, mix well with a wooden spatula so that veggies is not crushed. 8. Finally add chopped coriander leaves to it and serve hot with any snacks of your choice like the sabudana mixture or chutney or ketchup and enjoy. And like I always like to say, it will be… Yummmmmmmmmmmmm!!!!! 1. Veggies used should be fresh and of one’s choice. 2. Sujee used for the dish brings the required texture to the dish. 3. Water depends upon the variety of sujee is used. 5. Please do not pour water after adding oats , since it does not consume more water at all for cooking and the dish may turn mushy. 6. This could be a tiffin, breakfast and also a lunch-box dish for sure. This entry was posted in Uncategorized and tagged 45 minutes, Breakfast, Lunch box, oATS RECIPES/DISHES, Tiffin.